I use the medium of drawing as an exploration of my subjective experience in the context of the culture I live in—an analysis of my place in time that is entirely “me,” yet simultaneously transcends the mere personal to examine and critique the world I exist in, from realistic city life to the hyperreal of dystopic movies, videogames, and newsmedia. My work differs from personal narrative for these pieces are all to aware of the limitations of individual perspective, and as such connect the self to a wider social milleu, blending the two in a critical reflection of what I see as the chaos of environment, community, and economic disintegration. 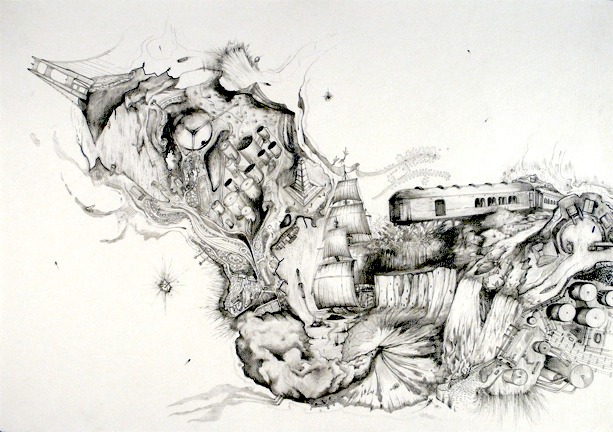 And yet my drawings are hopeful too—fragmentary yet organic, explosive yet controlled.